Windproof / anti-swirl net very effective. Can stay in place with the roof closed. Installs and disassembles quickly with the supplied fasteners. 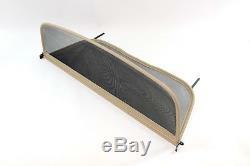 Frame made of metal and dressed in beige skai leather, black pvc net of high resistance. Audi a4 b6 / b7 convertible. Free delivery for metropolitan France and Belgium. (for other countries, please contact us before purchase). New equipment in its original packaging. Delivery is made in 3-5 days by ups with tracking. The item "windbreaker / anti-whitening net beige audi a4 b6 b7 cabrio free delivery" is on sale since Friday, January 12, 2018.